For a brief period, it seemed that the Moritomo Gakuen scandal which first swept through the Abe administration in March 2017 and re-emerged one month ago, was about to fade away. On March 27, in much-anticipated sworn testimony at the Diet, a former Finance Ministry official categorically denied Tuesday any involvement of Prime Minister Shinzo Abe, his wife or his top allies in a document falsification scandal that had rocked the government by pushing down voter approval rates in recent media polls. “It was never reported to the Prime Minister’s Office. It’s something that was conducted internally by the Financial Bureau” at the Finance Ministry, claimed Nobuhisa Sagawa quoted by the Japan Times, a former National Tax Agency head who oversaw the bureau when the document tampering is reported to have occurred — between February and April last year. Sagawa gave the testimony as a sworn witness, meaning he would be punished if he lied or refused to speak without legitimate reasons. Because of how much was at stake, and because of the solemn nature of his denial, the constant cloud of corruption that had dogged Abe for over a year, seemed to disperse and led to a modest rally in the Nikkei following Sagawa's testimony. Unfortunately for Abe, as we predicted in early March when the scandal erupted afresh, the ongoing attempts at covering up the Prime Minister's lies would backfire, and they did so spectacularly on Monday, when a Japanese Finance Ministry official admitted that nationalist school operator Moritomo Gakuen was instructed to provide false explanations for a deeply discounted land sale, igniting further speculation over the role of Prime Minister Shinzo Abe and his wife in the 2016 deal. "We are now more suspicious that the discount was made in consideration of the Abes," Kiyomi Tsujimoto, head of Diet affairs for the opposition Constitutional Democratic Party, told reporters Monday according to the Nikkei Asian Review. The Japanese government agreed in 2016 to sell a plot in Osaka Prefecture valued at 956 million yen ($8.93 million at current rates) for just 134 million yen to Moritomo Gakuen. The steep discount ostensibly was intended to cover the cost of waste disposal at the site shouldered by Moritomo. Akie Abe, the prime minister's wife, was appointed an honorary principal of the elementary school to be built on the land. And here's where the lies started to pile up. Financial Bureau chief Mitsuru Ota, center, appears in front of a Diet committee on April 9. The unexpected emergence of the truth sparked commotion and shock among opposition lawmakers at the meeting. 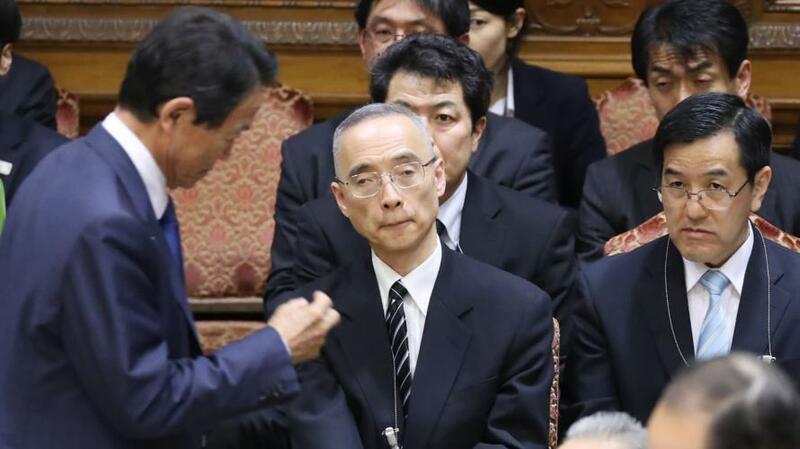 Even members of the ruling Liberal Democratic Party seemed stunned by the ministry's actions. One legislator banged on her desk, while another loudly called Ota "an idiot", perhaps for being dumb enough to tell the truth, and not realizing that the entire fate of Japan's Abeonomics - and Kuorda's QE - is not in peril. The cover up only got worse from here: Ota also said someone from his office told a staffer at the Kinki Local Financial Bureau, which oversaw the land sale, to urge Moritomo to stick to the story. But neither the Kinki bureau nor Moritomo's lawyer agreed. Ota also suggested that the abovementioned former National Tax Agency chief Nobuhisa Sagawa bore some fault. Sagawa, who led the Financial Bureau at the time, "spoke to a Diet committee without checking the facts" and "made comments that could be taken the wrong way," he said. In other words, he lied under oath. Meanwhile, some suspect a comment by the prime minister pressured Financial Bureau staffers to ensure they had a plausible reason for the discount. Worse, now that the cover up has emerged, Abe's job is in peril: "If I or my wife end up being involved, I will quit as prime minister and a lawmaker," Abe had said on Feb. 17, 2017. 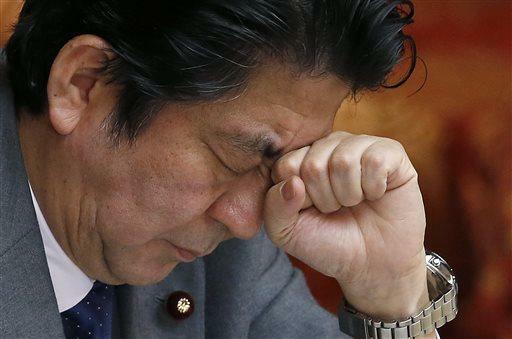 Needless to say, the long-overdue emergence of the truth is a disaster for Abe. 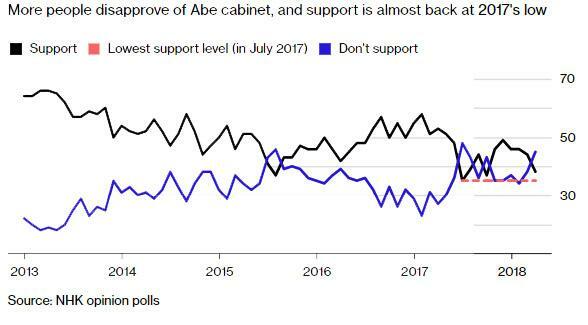 Over the weekend, and prior to Ota's testimony, the disapproval rating for Shinzo Abe’s Cabinet exceeded approval rating for the first time in 6 months in a survey conducted by JNN. According to Bloomberg, the approval rating fell 9.3% to 40%, while the disapproval rating rose 9.5% to 58.4%. Abe's latest plunge in approval - for which he apologized earlier in the day to parliament - however came not due to the Moritomo scandal but over another government documents scandal in a month: the most recent scandal relates to Japanese troops’ logs from Iraq, where they were dispatched starting in 2003 to show support for the U.S.-led military campaign. Opposition lawmakers have said Japan Self-Defense Force officers’ failure to inform the defense minister that they had found such documents throws doubt on civilian control over the military. And while the people may be willing to forgive the sniveling prime minister - who already quit once as prime minister a decade ago, blaming his resignation on clinical diarrhea - over the Iraq war snafu, getting caught lying in the Moritomo scandal may prove to be the last nail in the coffin of Abe's political career. And if Abe goes, so does the BOJ's Kuroda, and Japan's grand - if doomed - QE experiment.